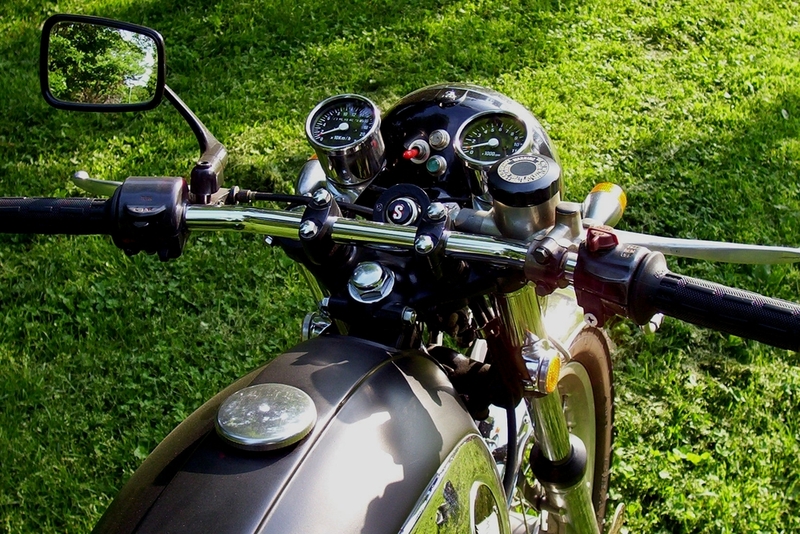 Most of us can recall the initial spark that prompted our passion for motorcycles. I recently realized that 2010 marks the 50th anniversary of my first encounter with the excitement generated by a motor and two wheels. It was the summer of 1960 and I was 6 years old. I am quite sure that I hounded my Uncle John mercilessly until he finally relented to my request for that first fateful ride. The machine was a 1957 Lambretta LD 125, its two-stroke engine, capable of a staggering 5.2 hp, according to the optimistic brochure. The ride took place in the garage-lined laneway behind my Grandmother Nina’s house on Clinton Street in downtown Toronto. This photograph brings back that memory in vivid detail. Perched on the back seat in a t-shirt, shorts and Red Ball Jet running shoes, with no jacket or helmet, my twenty-year old uncle rocketed up and down the laneway with me hanging on for dear life. It was a blissful blend of fear and excitement. I’m quite sure now, that Uncle John was probably hitting speeds of no more than 25 mph, but at the time the acceleration and speed seemed phenomenal. Your sense of relative speed is rather acute when your frame of reference is derived from a rusty red tricycle! That was the only ride that I ever got on that scooter, but the die was cast for future escapades. The years rolled by and occasionally certain events would trigger that spark to re-ignite. Steve McQueen’s motorcycle scenes in The Great Escape, as well as the TV series “Then Came Bronson” immediately spring to mind. But it was the film Easy Rider that finally pushed me over the edge. As the credits trailed at the end of that movie, I secretly vowed to get myself a motorcycle. It was 1972 when I finally got the chance to take the controls of a Honda CB100 at Toronto Cycle School. It was a long way down the food chain from Peter Fonda’s Star Spangled Harley, but at 18 years of age, that initial spark was finally intensified. That flame has continued to burn and from that day forward, I have always owned a motorcycle. I recently queried John about the fate of the little Lambretta that started it all, way back in 1960 and he related the full story, complete with its ultimate fall from grace. John was also an Aircraft Mechanic, long before I followed into that profession and was working as an apprentice at the Toronto Island Airport. He had purchased the scooter from one of the pilots in rather poor condition. Despite the scooter being only three years old, the pilot had done little to maintain it, so John purchased it as a bit of a “fixer-upper.” Apparently he only owned it for that one season after whipping it into tip-top working condition. His foolish affair with the scooter was terminated when he made the mistake of taking his girlfriend (now my Aunt Joanne) for a spin. She apparently did not share our enthusiasm for two-wheeled adventure and while his true love prevailed, sadly, the scooter did not. Being the ever frugal opportunist (the acorn never falls far from the tree!) John happily sold the Lambretta back to the same pilot for a small profit and purchased a 1952 Chevrolet from my Aunt Madeline. My uncle John never owned another scooter or motorcycle, but fortunately I have. That first ride all those years ago was a gift that kindled a love affair for me, that endures to this day. John and Joanne’s ride went pretty well too. After accomplished careers and raising three children, they are still together, both retired and still going strong. So I guess you could say, we all lived happily ever after. In retrospect, who would have believed, that a simple ride on a Lambretta scooter could become such a cornerstone of our future lives? For many of us hooked on this sport, motorcycles (and sometimes, even scooters) just have a way of doing that. Soichiro Honda was a creative innovator. In the 1960s, his vision produced reliable, oil-tight, small displacement motorcycles that anyone could ride. His company’s motto was, “You meet the nicest people on a Honda”, and suddenly the motorcycle was respectable. In the 1970s, Honda automobiles went mainstream and now the Honda name has a world-wide reputation for superior quality and sound engineering. An early experience made Mr. Honda a firm believer in research and development. Long before motorcycles, his first real business was manufacturing piston rings. Unfortunately there were problems. Due to lack of experience, the rings were brittle and broke easily. After much experimentation and nearing financial ruin, he found the answer. A higher silicone content made the rings strong and flexible and the company prospered. This was a lesson Mr. Honda and his company never forgot. To this day, no Honda product makes it to market without exhaustive testing. Anyone that knows me or has read any of my previous articles knows that I am a bit of a Honda fanatic. I have been riding and restoring Honda motorcycles for over 35 years. Perhaps you can imagine my delight when my two greatest passions, aviation and Honda motorcycles were now about to be combined in a way that I could never have imagined possible. Honda is finally entering the world of aviation. Personally I’m somewhat surprised that it took them so long. A friend recently asked me a question: “Sam, if Harley Davidson built airplanes, would you fly in one ?” My answer was; “not on your life, but if Honda built one, I would climb on board with confidence!” At Oshkosh 2006 the Honda Motor Company finally announced plans for production of their Hondajet. The plan is to have the “very light” business jet (VLJ) type certificated in the next 3 to 4 years. The prototype has already completed over 240 hours of flight testing. Honda also announced a new limited partnership with Piper Aircraft for sales, service and distribution. The fact that the company is building an aircraft is not surprising. Other automotive based companies have dabbled in aviation, such as Ford, Saab, Mitsubishi and countless others. What is interesting is that Honda is doing it all in-house, including producing their own high efficiency turbo fan engines! The flying prototype is an impressive piece of technology. The tiny 5 to 6 passenger twin engine jet has a composite structure fuselage and an integrally stiffened all aluminium wing. It’s unique over the wing mounted engine design improves aerodynamic performance at high speeds, while delivering a 420-knot cruise consumption of 0.75 pounds of fuel per hour. The HF118 turbo fan engines will be produced in partnership with aviation giant General Electric .The engines are rated at 1,670 pounds of thrust and have been flown reliably on a test bed Citation Jet for over 2 years. It is a twin spool design with single stage fan and two stage compressor, utilizing a two stage turbine. Honda has also created its own ultra-compact FADEC system (Full Authority Digital Electronic Control) which was originally developed for automotive applications. The engine has a dry weight of 392 pounds and a fan diameter of 17.4 inches. How the engines are mounted to the aircraft is a model of efficiency. By mounting them to the wing structure close to the fuselage, they retain good centralized thrust but lose the conventional fuselage structure and plumbing requirements, resulting in 30% more cabin space. The co-cured composite and honeycomb fuselage is both light and strong and enables pressurization to a maximum altitude of 41,000 feet. Cockpit display information is provided by a state of the art Garmin G1000 glass cockpit flat-panel system, with conventional dual-control-yoke flight controls. Other specifications include a maximum take-off weight of 9,200 pounds and a cruise range of 1,100 nautical miles. 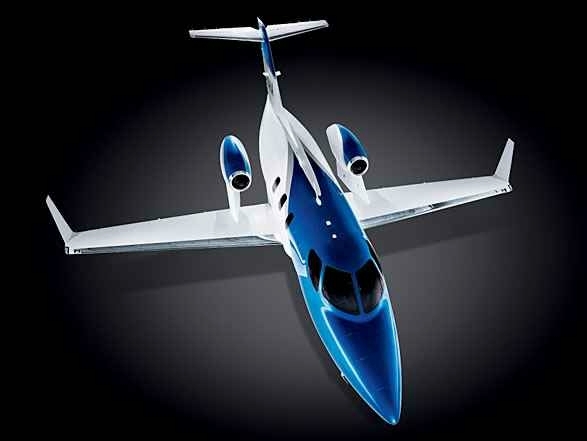 Honda first began research into the compact business jet arena in 1986, and although the future of their “very light jet’ project was often uncertain, the latest announcements and collaborations seem to prove that the Hondajet is on a solid footing for future production. Type Certification takes time, patience and resources, however there is no doubt, when you see the quality and sophistication of this prototype, that it won’t be long before the skies begin to fill with Honda built aircraft. Soichiro Honda passed away on August 5, 1991, before fully realizing the dream of seeing his tiny innovative Hondajet take flight. Its completion was never in question, and his company’s goal remained true. For a man that devoted a lifetime to perfecting personal transportation, efficient flight had to be an integral part of his ultimate ambition. Perhaps it’s no coincidence then that even his earliest motorcycles displayed the legendary symbol that hinted of great things to come. Congratulations Mr. Honda, your “Wing” has finally taken flight! Restoring old bikes is a great hobby. As a national pastime it has been around since Glenn Curtis invented the twist grip. Having the ability to now buy and sell parts in a worldwide market is a modern twist that really expands the hobbies horizons. For many enthusiasts, like myself, Ebay has certainly fulfilled that need. Although this CB500T was not purchased on Ebay, I believe that its inexpensive, Café Racer rebirth, could not have evolved without it. 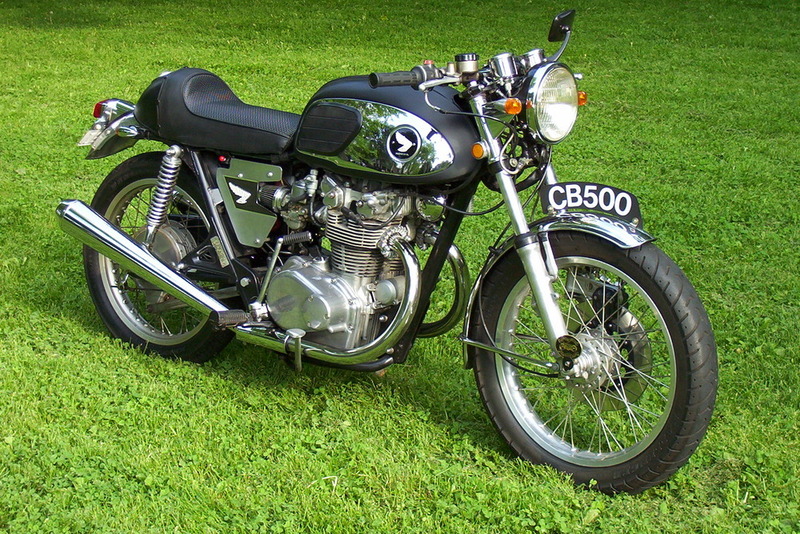 The CB500T was the final evolution of Honda’s venerable CB450. Although its torsion valve springs and double overhead cams were considered wildly innovative at its 1965 debut, by 1974 its design was being eclipsed by Honda’s excellent range of four cylinder jewels. The motor company decided to extend its life just a little longer by stroking the engine to 500 cc and restyling the bodywork. Unfortunately, lower compression and added weight made it slower than the 450 it replaced. In addition, the styling lacked focus and ultimately, after poor sales in ’75 and ’76, the model was dropped. In my opinion, a rather sad end to a once class leading thoroughbred. As with most Honda’s, the basic design was sound. So it was still an excellent candidate for my Café Racer project. I could easily change the styling and even shed some weight in the process. Perhaps I could even lend a little dignity to, this particular models, unfortunate, demise. The original bike was purchased locally. Word of mouth led me to a garage sale where the dusty, partially dismantled, bike lay buried beneath suburban clutter. Once dragged into the sunlight, it was duly noted that half of the engines top end was missing. Otherwise the bike was fairly complete with just 11,837 miles showing on the odometer. A deal was struck for $175, complete with ownership and yet another unwanted Honda was saved from oblivion. you guessed it, go shopping on Ebay. In preparation for its new sportier life, I cut and ground off all unnecessary brackets and simplified the wiring. An aircraft circuit breaker now serves as an ignition switch, with a Canadian Tire horn button for “centralized” electric starting. The stock indicator display was replaced with two aircraft panel lights set in the headlight shell. I also installed a toggle switch to select headlight use. My Ebay purchases included, new fork seals, used headlight, left tank panel, left engine cover, hex head engine bolt set, tune up kit, carb kits, gaskets, seals, aftermarket turn signals and a tail light. Of course it helps to have a garage full of used vintage Honda stuff. The gas tank was a left over from an earlier CB450 restoration, as were the enamel badges for the tank and seat tail. The side cover wings are early CB350 tank badges, underlaid with “carbon fibber”. The aluminum rims were both donations re-laced to the original hubs. The raw fiberglass solo seat was acquired in trade and upholstered by Marley Upholstery. The front license plate was donated to the project and mounted to a CB750 Super Sport front fender. The rear fender is aluminum and of unknown origins. Both fenders were already in stock. Local purchases from Ontario Cycle Salvage and the Canadian Vintage Motorcycle Group rounded out the remaining parts, including some really lucky finds. At $40, the 1970’s vintage chopper gauges were irresistible. Cycle Salvage also provided the Dunstall replicas, caliper seals, braided brake lines, flat bars, grips and other assorted bits. The CB450 header pipes were a $20 bargain from a fellow CVMG pal. Flat black paint was courtesy of Canadian Tire rattle cans. Centennial College, where I teach aircraft maintenance, was a great source of raw materials. The hand made side covers were fashioned using left over end cuts from an aircraft instrument panel. The missing engine parts were the biggest challenge. Fortunately, another CVMG contact provided a complete free engine with a locked transmission. I simply used the best bits from both engines to produce the final sweet running motor. Riding the bike is great fun, as long as you’re not in a hurry. Using my CB750 as a benchmark, it feels feather light and handles well. The vibration is tolerable if you short shift it around town, but wring it out to its 9000 rpm redline and the vibes are numbing. The seating position is surprisingly comfortable for my 5 foot 9, fifty-something frame, but this is definitely not a bike for long highway trips. The exhaust note is loud but not excessive and the brakes are superb for a 1970’s vintage ride. The original CB500T was homely, heavy and slow. It lacked any real styling focus and was the answer to the question that nobody asked. In contrast, my “Ebay Special” is prettier, lighter, sounds better and has a definite Café Racer flavor. Its small, splayed out instruments and kicked up Dunstalls are somewhat “Nortonesque” and the Bombers tank shape is reminiscent of an old vintage Manx. In my humble opinion, it is the best of both worlds, British good looks with a Japanese soul. Of course, with any custom machine, beauty is in the eye of the beholder, but for me it is hard to beat this little bike for the price. Thanks to Ebay, good friends, and a little horse- trading, that “CB500” proudly lettered on the front fender also stands for “complete budget $500”. As for the labor, well, we all know, when it comes to love, the labor is always free.